This variation on the traditional Silt Fence style provides rugged, reliable, and low maintenance silt control. Wire Backed Silt Fence will effectively protect storm water drainage systems from fouling with silt, and will protect you from environmental liability due to silt leaving your project site. 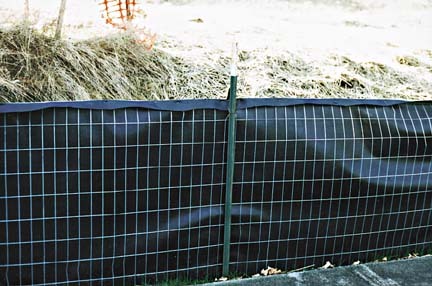 Wire Backed Silt Fence is constructed with a three or four foot high wire scrim (0.9 m or 1.22 m), covered with either a woven or a non-woven polypropylene filter fabric. The galvanized steel scrim supports the fabric in an upright position even under substantial loads of silt and water. A fabric apron extending beyond the wire is also available. The apron extends across the anchoring trench beneath the Silt Fence, and helps to anchor the fence and prevent undercutting. Layfield can provide metal T Posts and ties to secure the Wire Backed Silt Fence in position. Floating Silt Curtain (FSC) provides an effective and price sensitive system for isolating silt when working in the water.